At Wollman Rink, Community's R2-94Z speaker units were placed on poles away from the walls and as close to trees and rock formations so that they would blend into the surrounding environment of the park area.NEW YORK, NY-After many years of heavy use and weather related degradation, the sound system at the famous Wollman Rink in New York's Central Park has received a complete makeover. Toward the end of last year's skating season, the Trump Organization, which has maintained the rink for the city for the last five years, decided to replace all outdoor speaker systems and refurbish the deejay booth. They brought in Bob Casey of Dale Pro Audio, who had designed and updated the present sound system at the Rockefeller Center Ice Rink. 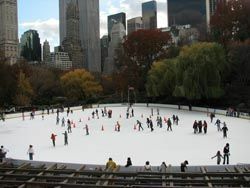 "I had a few mountains to climb with the Wollman Rink," Casey said. "First of all it was outdoors, and, like Rockefeller Center, it was a landmark area. Everything outdoors had to meet with the approval of a higher power. In this case it was the Central Park Conservancy. Next, there was the sound projection pattern. At Wollman I had to create a throw that was short and wide. The sound had to stay within the rink area. "Finally, and in my opinion most importantly, the speakers had to not only be weather resistant but had to be weatherproof," he continued. "There was to be no special housing constructed to protect any of the speaker units. Once in place, they were to be on their own." Casey turned to Community Professional's R Series speaker units, known for their outdoor integrity. He worked closely with that company's technical applications group, who did an acoustic simulation of the entire rink area and then submitted SPL plots for various speakers. Casey selected the R2-94Z. "I knew the speakers had to go high," Casey said of the placement. Rink manager Barry Weisselberg also serves as the resident deejay. "Community wanted them to be 20 feet up from the ice, but the Central Park Conservancy said 'No way! '-so we compromised at 10 feet. However the poles were placed back a ways from the rink walls and as close to trees and rock formations so that they would blend into the surrounding environment of the park area." Casey also turned to Community for its R-6 bass horn. "I told him that the bass had to be big-no question-we want to feel it on the ice," said rink manager Barry Weisselberg, who also serves as deejay. "During the day, we track MP3s or CDs but at night, my goal was to attract a younger crowd. So I go into my personal library of music and make this place really rock." Casey specified two horns and set the crossover at about 125Hz with a 12-db slope. Using two Crown MA5002VZ power amps in bridge mode, 10,000 watts of hard thumping bass can be pumped onto the ice. "The smaller speakers around the rink sound so good, we only really turn up the bass at night or when we're playing more contemporary music for the younger crowd. There's not a dead spot anywhere on the ice," Weisselberg said. To counter the slap-back sound that is heard in the staging area, a series of 10 JBL-25T speaker systems were mounted above the skaters on a wooden trellis in front of the skate house. Another 10 speakers are inside the skate house around the restrooms, snack bar, and locker area.